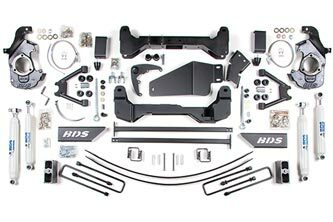 This kit is based around new upper A-Arms, two one-piece, ¼” laser cut high clearance crossmembers and replacement steering knuckles. The high clearance crossmembers increase ground clearance for off road performance. Compression struts are included to support the crossmembers under impact. The replacement steering knuckles reduce installation time as well as maintain proper steering angles and ball joint angles. A differential skid plate is included for off road protection. Front stainless steel braided brake lines are included for optimum performance and to ease installation. Special torsion bar unloading tool required for installation. System will not work on some '88-95 vehicles with spindle mounted front ABS sensors. Not recommended for long box extra cab models due to OEM crossmember interference. All models equipped with auto-trac may require a new front driveshaft. This can be identified by the "NP246" plaque on the back of the transfer case or the "Auto 4WD" dash display.